London South Bank University (LSBU) hosted a conference this week to celebrate and re-affirm the University’s ongoing collaborative partnership with the British University in Egypt (BUE) and to announce the establishment of a BUE Centre at LSBU to help support staff and student exchanges, linked to both teaching activity and research projects. The President of BUE – Professor Ahmed Hamad and senior academics from both universities were invited to hear former Home Secretary, Rt. Hon Charles Clarke, give the keynote speech which was followed by a panel discussion and a question and answer session with the audience. In his address, Charles Clarke highlighted the productivity of the ongoing partnership between the two universities and spoke about the importance of students being able to network and collaborate internationally. Mr Clarke also spoke about the essential requirement for students to achieve qualifications formally recognised by employer accreditation, in order to ease their access to the international employment market. Other speakers on the panel included Nasser Kamel, Ambassador for Egypt to the UK, Pauline Perry, Baroness of Southwark, Professor Lesley Croxford, Vice President of BUE and Professor Charles Egbu LSBU’s Dean of the School of Architecture and the Built Environment. Speaking at the event, Prof. David Phoenix, Vice-Chancellor of LSBU said: “I am delighted to see that LSBU’s ongoing partnership with BUE is proving to be so successful in helping to foster the education of around 4000 students in Cairo. “Our collaboration with the BUE is already flourishing and has ensured that we are able to continue to maintain a programme of high quality applied and translational research across a broad array of subjects from transport infrastructure to sustainability and nanotechnology. Around 100 delegates were invited to witness the formal presentation of three commemorative silver salvers, marking the occasion and take part in the following discussion and question and answer session. 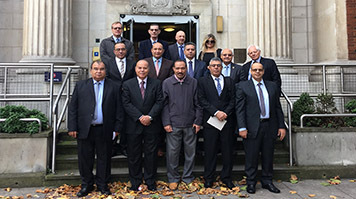 Egyptian journalists attending the conference were taken on a tour of LSBU's campus beforehand. Read more about current research programmes at the British University in Egypt.